Here are examples which, to me, indicate just how ridiculous the standard models are when it comes to geomorhology. The creation of the boulder field was by the continual freeze thaw process in the ridges southwest of the field. ..‘impact boulder fields’, formed in small secondary impacts from material sloughed off from the primary comet impact which formed the 450 km diameter Nastapoka arc of lower Hudson Bay, 12.8 ± 0.15 ka. The 12.8 ka date I would support, bu not the impact theory. There is only one force that can produce such features. Wish I could have had a closer look at this supposed glacial erratic. Clicking the image at the site gives a better look at the streaks. It appears to my biased eyes that the vertical streaks of material leading down to the strata containing the boulder would have been current channels, and that this boulder would have been formed in place, as are many or perhaps all of the erratics found above or below ground. That these large erratics, often with very smooth surfaces are the result of this boulder having been rounded and smoothed by traveling hundreds or thousands of miles in a glacier or by mega floods from glacial dam bursts, well, I don't believe it. They would have been scratched, gouged, chipped or broken by other rocks. 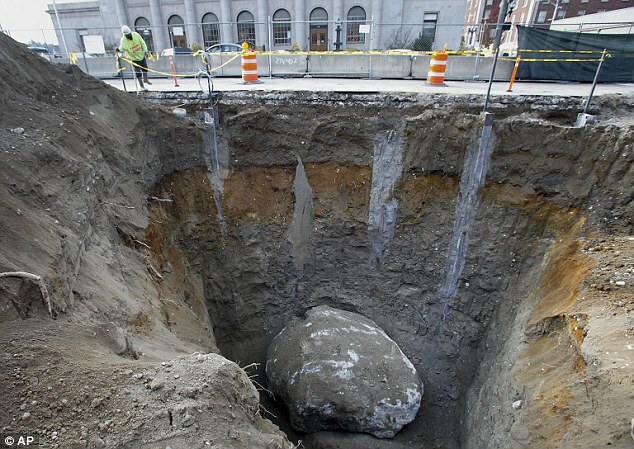 How did these giant boulders get here? So boulder deposits are found on shorelines around the world. This is to be expected if all the shorelines have been subject to great electromagnetic forces that can shatter and eject the blocks. The model I see is that the ocean and other water surfaces become extremely highly charged when a major solar storm is in progress, and an intense double layer forms close to the surface. The electric field is strong enough to fracture and shatter rock, which is then tossed by the Coulomb force. Similar forces also created all the rounded pebbles, cobbles and boulders found on the beaches and along the rivers, and the rivers flowing to the sea themselves created when the charge on the ocean surface 'breaks out' and climbs the valleys to find a source of electrons from the hill and mountain peaks which will naturally have the greatest electron density. The Earths surface has been altered many times, and at each event the shorelines would have been eroded back further, and the ancient shorelines the standard model geologists have identified are indeed ancient shorelines, but have not been formed by the constant wave action of the sea level of the time, but the action of successive electromagnetic events. The shape of the continents then has nothing to do with continental drift, tectonics, a growing Earth, but all by electromagnetic forces, and IMO, all due to the cyclic nature of the severest of solar storms. My reasoning suggests events roughly every 3200 years, and that another such event is likely any time between now and the next 2-300 years. The events may vary in magnitude and location, sometimes localised, sometimes global, as Solon learned from the ancient Egyptians, and that sometimes there were no survivors. Have a nice day. This (once) mountain looks like the middle has been excavated and turned into a river of stone by some great force. Glaciers of course. Was it water that cut this passage?? I find that very difficult to believe. Looks more like another example of the work of subterranean glaciers! I have been enjoying the series of posts and videos by Andrew Hall on the effects of electrical forces in the formation of the features observed at the locations he has studied, but one of the components of the large magnitude forces has not so far been addressed, and that is the RF and microwave fields that will naturally be generated. The drying, heating and melting and fracturing of rocks are processes used industrially so there is much info available on such processes. I applaud Andrews efforts and know from my own research on the electrical effects on the coast, hills and mountains, rivers, streams and creeks in my region just how much physical effort is involved, and I don't think my poor old legs will ever fully recover! Good show Andrew! As the ancient site of Petra is on the list of places I'd like to visit, I was pleased to see this youtube vid by Brien Foerster. I, like Brien, did not realise the extent of the site, and now I'm even more keen to get there one day. Brien feels that much of the erosion is by water and weathering over many thousands of years, but to my eye most of it is clearly the signs of plasma erosion and electrical fracturing, and likely other E/M effects. He does consider Schochs proposal, and my favourite, of a major proton storm at the time, while the TB team would seem to think a near approach of Mars, and then there is an interloper such as Nibiru though that would be at the 3000 or so y.a. period. The stone is diorite, tough stuff, so he is convinced the rock cut structures must be way older than the Nabatean or Roman parts. Older, yes, not not as old as he proposes though if this was a plasma event which could have been relatively recent. I haven't read "Ages in Chaos"yet but it's on my reading list as it may shed a little light on the dating of these events. What we see here does show great erosion in many places, yet other parts seem relatively sound. What if though, there were parts that have been completely eroded, whole buildings or suburbs may have completely disappeared, turned to sand? Beirut is the track of a discharge. Perhaps the whole of the Mediterranean sea and its surrounds was affected at the same time, and in the proton storm model then the sea surface would have become highly charged, causing the extreme erosion apparent on the coasts. The slot canyons at Petra must obviously have been there before the rock cut structures such as the Treasury were created, but the slot canyons too are electrically carved IMO, so maybe there are periodic cyclical events. We have many of them on Vancouver island, and of course they are cut by water according to geologists, but I'm sure that petrological studies would show that metamorphosis of the exposed surfaces has occurred, likely by ion implantation. I also watched a recent NewEarth video "The Unearthly Rock-cut Ruins of Turkey"
The author similarly believes the erosion indicates great age, but in places the signs are such that it would have taken millions of years for weathering to do such work, the coast and islands of sections of the Black sea being an extreme example. My belief is that many of the eroded structure may be less than 6000 years old, perhaps only 2000, in which case the events that did the work are quite recent and likely happen every few thousand years. Heads-up? When Lee went down, he was right down on bedrock — there were no boulders, no gravel, no cobbles, nothing. Everything had been stripped right out of there, which tells you that the force and volume of the water coming down in spring is gigantic. Quite the discharge I'd say. The exact location has not been released but looking on Google Earth at the park there seem to be many indicators of EM forces at work. Be interesting to see where the water emerges from the cave. Not surprisingly Canadian Geo did not allow my comment about the cave being of electrical origin. The ejecta lying around the entrance was not due to water, not matter how much of it they might think may run down there. Maybe I should be more conventional and suggest an impactor, an almost pure metal meteor travelling faster than a Rod from God. What should be done is to examine the debris and look for signs of changes in colour, composition, embedded ions, micro-spherules, nano diamonds, and also from the entrance walls. I'm sure something interesting would show up. 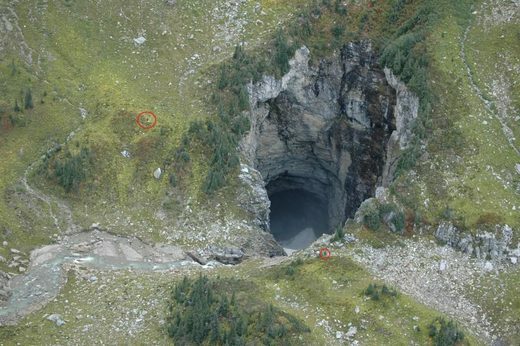 Did Canadian Geo ever conduct a magnetometer survey of this area? I don't see anything about magnetometers, but the park is intended to be free of resource extraction so little has been done in that respect. Geologically it is volcanic and glacial action that has shaped the land, though what they see as glacial is all electrical/plasma in my book. Using Google Earth it can be seen there are numerous cirques in the park, many with lakes, but all the cirques I have visited have either rounded, melted looking mounds at their outfalls, or in some the outfall is plugged by some of the largest, smooth and rounded boulders I have come across. They look totally out of place and hard to imagine how they got there, but if you accept they were formed in situ then the problem is solved. I suppose it's like the US National Park Service: They get very huffy, if any detection gear shows up in parks. The electrical discharges should have left magnetic traces, as found in Kimberlite Pipes. They say it's limestone so most probably not, but evidence of forces other than water/ice/weathering should be easy to spot, if you were looking for them, but standard geologists would not be of course. 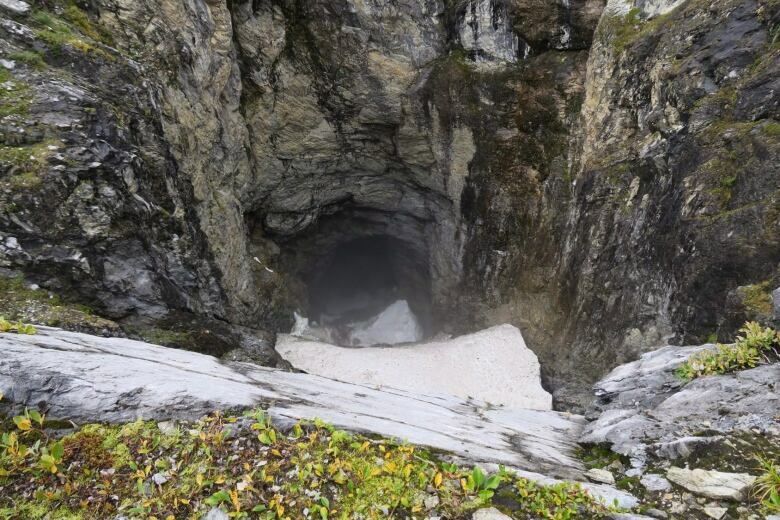 Geologist Catherine Hickson said "This is not a place for the casual visitor.And, of course, there's no fences," she added. Seems a little extreme, but the possibility of there being some cultural significance to the cave is a valid point. Perhaps the legends of the peoples of the area might hint at some past event. Maybe the two headed serpent again? 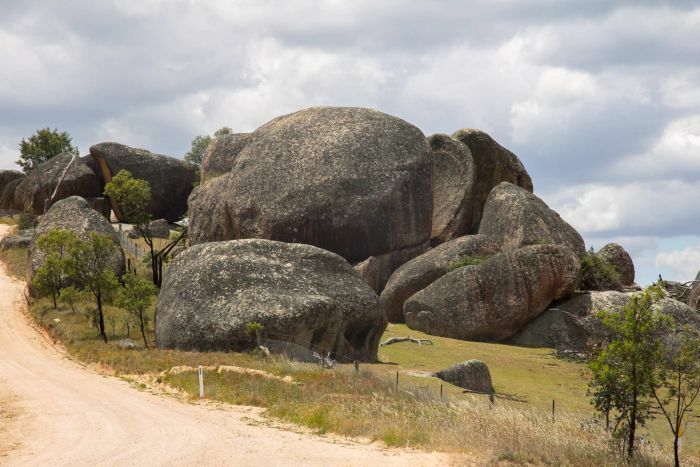 How did the amazing boulders of Rock Forest near Bathurst come to be? The explanation given by the geologist sounds like a real fairy tale to me.